Ginetta Candelario is professor of sociology and a faculty affiliate of the Latin American and Latina/o Studies Program, the Study of Women and Gender Program, the Community Engagement and Social Change Concentration, and also served on the advisory group for the Gloria Steinem & Wilma Mankiller School for Organizers at Smith College. She is the current editor of Meridians: feminism, race, transnationalism and the founding vice president of the National Latin@ Studies Association (LSA). Candelario's research interests include Dominican history and society, with a focus on national identity formation and women’s history; Blackness in the Americas; Latin American, Caribbean and Latina feminisms; Latina/o communities (particularly Cuban, Dominican and Puerto Rican); U.S. beauty culture; and museum studies. She has been a Fulbright Scholar in the Dominican Republic twice, in 2003 and 2016 and her first book, Black behind the ears: Dominican Racial Identity from Museums to Beauty Shops (Duke UP, 2007), received the 2009 Best Book Award from the Latino Studies Section of the Latin American Studies Association and the 2008 Best Book Award from the New England Council of Latin American Studies. Candelario's work has also appeared in interdisciplinary journals such as Latino Studies, West Indian Guide, Small Axe, Meridians: Feminism, Race, Transnationalism, Phoebe, and in Latina/o studies anthologies, including Keywords in Latino Studies, Oxford Dictionary of Caribbean and Afro-Latin American Biography, The Oxford Encyclopedia of Latinos and Latinas in Contemporary Politics, Law and Social Movements, The Afro-Latino Reader, the Dominican Republic Reader and A Companion to Latino Studies, among others. She has been teaching community-based learning and research courses on The Sociology of Hispanic Caribbean Communities in the U.S. in collaboration with a dozen Holyoke, Massachusetts, community-based organizations and nonprofits for more than a decade, for which she has received various awards. Jonathan Cohen is a poet, translator, essayist, and scholar of inter-American literature. Winner of the Robert Payne Award of the Translation Center at Columbia University, he has translated the work of Latin American poets Pedro Mir (Countersong to Walt Whitman and Other Poems, Peepal Tree Press), Ernesto Cardenal (Pluriverse: New and Selected Poems, New Directions), Enrique Lihn (The Dark Room and Other Poems, New Directions), and Roque Dalton (Small Hours of the Night, Curbstone Press). He is the author of A Pan-American Life (University of Wisconsin Press), the only biography of Muna Lee, the premier translator of Latin American poetry in the early twentieth century. He is editor of William Carlos Williams’s By Word of Mouth: Poems from the Spanish, 1916–1959 and the “Centennial Edition” of Williams’s Al Que Quiere!—both published by New Directions. His edition of Williams’s translation of the Spanish Golden Age novella, The Dog and the Fever, by Pedro Espinosa, was just published by Wesleyan University Press. For more info, visit jonathancohenweb.com. Zaida Corniel is a Lecturer in the department of Hispanic Languages and Literature at Stony Brook University, and she also teaches in the Department of Latin American and Latin Studies (LALS) at Lehman College. She specializes in Hispanic Caribbean literature and culture, Latino studies, Dominican diaspora, and theater. Her research interest focus on tourism, migration, race, gender, and representation of the Caribbean subjectivities in contemporary narrative including propaganda, performance, visual art and films. Dinorah Coronado was born in the Dominican Republic. She is a poet, writer, playwright, and essayist. nació en la República Dominicana. She has published two books of poetry: Interioridades and Andanzas poéticas. She recently published a book of short stories, Olor a Nueva York. She has received awards for her theater, novels, and poetry. Her writing has appeared in local and international journals and anthologies. She is the founder of Teatro Coronado (the Coronado Theater). Roberto Márquez is the William R. Kenan, Jr. Professor Emeritus of Latin American and Caribbean Studies at Mount Holyoke College. He is one among the initial group of "founding-faculty" of Hampshire College, Amherst, Ma., where he taught for many years (1970-1986). An alumnus of the Bronx Community College evening school's "Operation Second Chance" program, he received his B.A. from Brandeis University, in 1966, and an M.A. and Ph.D. from Harvard University. Granted a Fulbright Fellowship Award for study in Peru (1966-67), he has also received National Endowment for the Humanities and Tinker Foundation Postdoctoral Fellowships, and a Coordinating Council on Literary Magazines (CCLM) Editor's Fellowship Award for his work as founder-editor of Caliban: A Journal of New World Thought and Writing. Prof. Márquez has served on the Board of Advisory Editors of The American Quarterly, the Advisory Board of The Curbstone Press, the Board of Directors of the North American Congress on Latin America (NACLA) and on the Editorial Board of NACLA's Report on The Americas (1991-96). He has, in addition, served as a member of the Advisory Committee of the Clarence L. Holte Literary Prize; as part of the International Jury for the prestigious Premio Casa de Las Americas (1977 & 2009); as a member of the Editorial Board of The Massachusetts Review; and as Area Coordinator of the Migrant Education Program of Middlesex County, Massachusetts. Professor Márquez is the editor-translator of more than three volumes of the poetry of Nicolás Guillén, including Patria o Muerte: The Great Zoo and Other Poems; Man-Making Words: Selected Poems (with D.A. McMurray); and My Last Name. Editor of the bilingual collection Latin American Revolutionary Poetry, he is also translator-editor of Puerto Rican Poetry: An Anthology from Aboriginal to Contemporary Times. His most recent volume, A World among These Islands: Essays on Literature, Race, and National Identity in Antillean America (University of Massachusetts Press), was published in the fall of 2010. Professor Márquez’s scholarly work, reviews, and commentaries have appeared in a variety of publications both here and abroad, including Sin nombre (Puerto Rico), La Torre (Puerto Rico), Casa de Las Americas (Havana), Escritura (Venezuela), Jamaica Journal (Kingstown), West Indian Guide (Baltimore & The Hague), Anales del Caribe (Havana), Al margen (Colombia), Ideologies and Literature, Latin American Research Review, The New York Times Book Review, The Village Voice Literary Supplement, The Latino Review of Books, The Latino/a Research Review, and Centro: Journal of the Center for Puerto Rican Studies, as well as in the Encyclopedia of Latin American History and Culture, and the Encyclopedia of African American Culture and History. Juan Matos (1955); Dominican educator residing in Worcester, MA, USA. Author of Crecer (1989); Amor de noche y mar (1996); De las parras (1997); De mi desidia (1999); Con pecado concebido (2001); Azúcar, cayo y puerto (2002); Del milagro de la espera (2005).Temblor de espejos (2011); The Man Who Left/El hombre que se fue (2017) y Sugar, Cape and Port/Azúcar, cayo y puerto (2018). Founding member of the following literary groups and workshops: Word; Cultural Expression (PEC) in NYC; The Hostos Cultural Group in Worcester, MA; The Pedro Mir Writers’ Workshop in Lawrence, MA. His works have been featured in numerous anthologies and literary reviews. Matos is a graduate if the Autonomous University of Santo Domingo, with a degree in Chemistry. He earned a Master’s Degree in Elementary School Education at Lehmann College, the Bronx, NY; and a Master’s Degree in Bilingual Education at Worcester University, MA. He has undertaken studies in literature at the Complutense University of Madrid and the University of Alcalá in Henares, Spain. Currently he teaches Advanced Placement Spanish Literature and Culture classes at North High School Worcester, MA, and is a member of the Dominican Cultural House of Worcester. Sintia E. Molina is a Professor of Latin American and Caribbean literature, and Spanish language in the Fine Arts, Foreign Languages and International Cultural Studies Department at St. Francis College in Brooklyn, New York. She received her PhD in Latin American and Caribbean literature from the Graduate School and University Center of the City University of New York (CUNY). She has edited Escritoras dominicanas a la deriva, Verbum, 2014, co-edited Dominican Migration: Transnational Perspectives, UP Florida (2005), and is the author of El naturalismo en la novela cubana, UP America (2001). She has published essays on language and literature in anthologies and literary journals. Her scholarly research focus on Latino/a literature, women’s studies and the Caribbean. Dan-el Padilla Peralta is Assistant Professor of Classics at Princeton University, where he teaches and writes about Roman cultural history and classical reception; the global history of slavery and citizenship; and the reception of Greco-Roman antiquity in the colonial and postcolonial Hispanophone Caribbean. He is affiliated with Princeton’s Programs in Latino Studies and Latin American Studies, and with the University Center for Human Values. His book on state formation and religious practice in 4th and 3rd-century BCE Roman Italy is under contract with Princeton University Press, and a co-authored book on the magical year 338 BCE is under contract with Harvard University Press. He has co-edited a volume on appropriation in Roman culture for Cambridge University Press (Rome, empire of plunder: the dynamics of cultural appropriation ) and published multiple articles on Roman literary and cultural history. In the field of classical reception, he is interested primarily in how ancient Greece and Rome are hardwired into the racial politics of the Dominican Republic: two forthcoming essays in OUP edited volumes lay the groundwork for a book provisionally entitled Racial classics in postcolonial Hispaniola, in which Pedro Mir will figure prominently. In addition to writing for academic publications, Dan-el is committed to public-facing scholarship and advocacy. He is a contributor to and editorial board member of the journal Eidolon and has published short pieces with The Guardian, Matter, Vox, and The New York Times. His 2015 memoir Undocumented: A Dominican Boy’s Odyssey from a Homeless Shelter to Ivy League (Penguin) received an Alex Award from the American Library Association. Rosa Mirna Sánchez is an Assistant Professor of Spanish Language, Literature and Culture in the Department of Modern Languages at Caldwell University. She earned her BA in Latin American Studies from Barnard College, Columbia University and her Masters and Doctorate degrees in Spanish Literature from the University of Virginia. Her research focuses on 20th-century Hispanic literature, especially re-writings of canonical works. Silvio Torres-Saillant is Professor of English and Dean’s Professor of the Humanities at Syracuse University, where he has headed the Latino-Latin American Studies Program, served a two-year term as William P. Tolley Distinguished Teaching Professor in the Humanities, and directed the Humanities Council. His research centers on intellectual history, Latino discourse, ethnic American literatures, and comparative poetics, and the racial regimes spawned by the colonial transaction. He has authored Caribbean Poetics (1997; 2nd ed. 2013), El tigueraje intelectual (2002; 2nd ed. 2011), Introduction to Dominican Blackness (1999; 2nd ed. 2010), An Intellectual History of the Caribbean (2006), Diasporic Disquisitions: Dominicanists, Transnationalism, and the Community (2000), and El retorno de las yolas: Ensayos sobre diáspora, democracia y dominicanidad (1999). He has co-authored The Dominican-Americans (1998) with sociologist Ramona Hernandez and The Once and Future Muse: The Poetry and Poetics of Rhina P. Espaillat (2018) with literary scholar Nancy Kang. He is co-editor of The Challenges of Higher Education in the Hispanic Caribbean (2004), Desde la orilla: Hacia una nacionalidad sin desalojos (2004), and Recovering the U.S. Hispanic Literary Heritage, Vol. IV (2002). He is currently at work on “Racial Selfhoods: The Rise of Western Identity and the Fracture of the Human,” a study that seeks to tell the story of how we became racial beings. A frequent lecturer at home and abroad, he was inaugural speaker for the Birmingham Modern Languages Lecture Series, University of Birmingham, UK, in 2012 and delivered the 2013 Annual Walter Rodney Memorial Lecture at the University of Warwick in Coventry, UK. He served on the non-fiction panel of the OCM Bocas Prize and lectured in the 2015 NGC BOCAS Lit Fest in Port of Spain, Trinidad & Tobago. He delivered a “special lecture” (Círculo de Conferencias Especiales) during the Dominican Republic’s XIX International Book Fair Santo Domingo 2016 and gave the keynote address to open the 58th Casa de las Américas Literary Prize, in Havana, Cuba, 2017. In 2018 he was the opening keynote speaker in the conference “Global Dominican—Politics, Economics, and Cultural Production” held at the Senate House, University of London, England, UK, among others. Torres-Saillant held his first faculty position in the English Department of Hostos Community College, of the City University of New York, and was the founding director of the CUNY Dominican Studies Institute at the City College of New York. Word Up Librería Comunitaria presenta el primer SIMPOSIO PEDRO MIR. Ginetta Candelario es profesora de Sociología y está afiliada a la facultad en el Programa de Estudios Latinoamericanos y de Latina/o, el Programa de Estudios de Mujeres y de Género, el Involucro de la Comunidad y la Concentración de Cambio Social, y también formó parte del grupo consejero de la Escuela de Organizadores de Gloria Steinem & Wilma Mankiller en el Smith College. Es la actual editora de Meridians: feminism, race, transnationalism y la vicepresidente fundadora de la Asociación de Estudios @ Latin Nacional (LSA). Los temas de investigación en los cuales Candelario está interesada incluyen la historia y la sociedad dominicanas, enfocándose en la formación de identidad nacional y en la historia de las mujeres; el estado y la propiedad de la piel oscura (blackness) en las Américas; feminismos Latinoamericanos, del Caribe y de Latinas; comunidades de latina/o (en particular Cubanas, Dominicanas y Puertorriqueñas); la cultura de la belleza en Estados Unidos; y estudios de museos. Ha recibido la Beca Fulbright dos veces en la República Dominicana, en 2003 y en 2016 y su primer libro, Black behind the ears: Dominican Racial Identity from Museums to Beauty Shops (Duke UP, 2007), recibió el Premio del Mejor Libro en 2009 en la Sección de Estudios Latinos de la Asociación de Estudios Latinoamericanos y el Premio del Mejor Libro en 2008 del Consejo de New England de Estudios Latinoamericanos. La obra de Candelario también ha sido publicada en revistas interdisciplinarias tales como Latino Studies, West Indian Guide, Small Axe, Meridians: Feminism, Race, Transnationalism, Phoebe, y en antologías de estudios de Latina/o, incluyendo Keywords in Latino Studies, Oxford Dictionary of Caribbean and Afro-Latin American Biography, The Oxford Encyclopedia of Latinos and Latinas in Contemporary Politics, Law and Social Movements, The Afro-Latino Reader, the Dominican Republic Reader y A Companion to Latino Studies, entre otros. Ha dado clases de aprendizaje e investigación a la comunidad sobre La Sociología de las Comunidades Hispánicas del Caribe en los Estados Unidos, en colaboración con una docena de organizaciones sin fines de lucro, basadas en la comunidad en Holyoke, Massachusetts, por más de una década, por las cuales ha recibido varios premios. es un poeta, traductor, ensayista, y escolar de la literatura interamericana. Ganador del Premio Robert Payne otorgado por el Centro de Traducción de la Universidad de Columbia, ha traducido la obra de los poetas latinoamericanos Pedro Mir (Countersong to Walt Whitman and Other Poems, Peepal Tree Press), Ernesto Cardenal (Pluriverse: New and Selected Poems, New Directions), Enrique Lihn (The Dark Room and Other Poems, New Directions), y Roque Dalton (Small Hours of the Night, Curbstone Press). Es el autor de A Pan-American Life (University of Wisconsin Press), la única biografía de Muna Lee, la primera traductora de poesía latinoamericana en la primera parte del siglo veinte. Es editor de By Word of Mouth: Poems from the Spanish, 1916–1959 de William Carlos Williams y de “Centennial Edition” Al Que Quiere! de Williams--ambos publicados por New Directions. Su edición de la traducción de la novela de la Spanish Golden Age, The Dog and the Fever, de Pedro Espinosa, ha sido publicada recientemente por Wesleyan University Press. Para más información, visite jonathancohenweb.com. Zaida Corniel es profesora en el Departamento de Lenguas y Literatura Hispánicas en la Universidad de Stony Brook, y también enseña en el departamento de estudios de Latín y Latinoamericanos (LALS) en el Lehman College. Se especializa en literatura y cultura Hispánica del Caribe, estudios de Latino, la diáspora Dominicana, y teatro. El foco de su investigación se interesa en el turismo, la migración, la raza, el género, y la representación de las subjetividades Caribeñas en la narrativa contemporánea, incluyendo la propaganda, las funciones, las artes visuales y el cine. Dinorah Coronado nació en la República Dominicana. Es poeta, narradora, dramaturga y ensayista. Ha publicado dos poemarios: Interioridades y Andanzas poéticas. Recientemente publicó su libro de cuentos Olor a Nueva York. Ha sido premiada en teatro, novela y poesía. Sus textos aparecen en revistas y antologías locales e internacionales. Es la fundadora del Teatro Coronado. David Cortés Cabán (Arecibo, Puerto Rico, 1952). Posee una Maestría en Literatura Española e Hispanoamericana The City College (CUNY). Fue maestro en las Escuelas Públicas de Nueva York y profesor adjunto del Departamento de Lenguas Modernas de Hostos Community College of the City University of New York. Ha publicado los siguientes libros de poesía: Poemas y otros silencios (1981), Al final de las palabras (1985), Una hora antes (1991), El libro de los regresos (1999), Ritual de pájaros: antología personal (2004), Islas (2011), y Lugar sin fin (2017). En ensayo: “Visión poética en tres libros de Alfredo Pérez Alencart” (2017). Roberto Márquez es el Profesor Emérito William R. Kenan, Jr. de Estudios Latinoamericanos y del Caribe en el Mount Holyoke College. Pertenece al grupo inicial de la “facultad fundadora” del Hampshire College, Amherst, Ma., donde enseñó durante muchos años (1970-1986). Graduado del programa vespertino “Operation Second Hand” del Bronx Community College, recibió su B.A. de Brandeis University, en 1966, y un M.A. y Ph.D. de Harvard University. Fue becado con el Fulbright Fellowship Award por sus estudios en Perú (1966-67), y también recibió el National Endowment para las Humanidades y las Becas para Postdoctorado de la Fundación Tinker, así como un Premio Beca para Editores otorgado por el Consejo Coordinador de Revistas Literarias (CCLM) por su trabajo como fundador-editor de Caliban: A Journal of New World Thought and Writing. El Prof. Márquez ha servido en la Junta Directiva de Editores Asesores de The American Quarterly, en la Junta Directiva Asesora de The Curbstone Press, en la Junta Directiva del North American Congress on Latin America (NACLA) y en la Junta Editorial de NACLA's Report on The Americas (1991-96). Además, ha servido como miembro del Comité Asesor del Premio Literario Clarence L. Holte Literary Prize; como parte del Jurado Internacional del prestigioso Premio Casa de Las Americas (1977 & 2009); como miembro de la Junta Editorial de The Massachusetts Review; y como Coordinador del Area del Migrant Education Program de Middlesex County, Massachusetts. El Profesor Márquez es editor-traductor de más de tres volúmenes de poesías de Nicolás Guillén, incluyendo Patria o Muerte: The Great Zoo and Other Poems; Man-Making Words: Selected Poems (con D.A. McMurray); y My Last Name. Editor de la colección bilingue Latin American Revolutionary Poetry, es también traductor-editor de Puerto Rican Poetry: An Anthology from Aboriginal to Contemporary Times. Su volumen más reciente, A World among These Islands: Essays on Literature, Race, and National Identity in Antillean America (University of Massachusetts Press), fue publicado en el otoño de 2010. La obra escolar del Profesor Márquez, sus análisis, y comentarios han aparecido en una serie de publicaciones tanto aquí como en el extranjero, incluyendo Sin nombre (Puerto Rico), La Torre (Puerto Rico), Casa de Las Americas (Havana), Escritura (Venezuela), Jamaica Journal (Kingstown), West Indian Guide (Baltimore & The Hague), Anales del Caribe (Havana), Al margen (Colombia), Ideologies and Literature, Latin American Research Review, The New York Times Book Review, The Village Voice Literary Supplement, The Latino Review of Books, The Latino/a Research Review, and Centro: Journal of the Center for Puerto Rican Studies, así como en la Encyclopedia of Latin American History and Culture, y en la Encyclopedia of African American Culture and History. Juan Matos (1955); educador dominicano residente en Worcester, MA –USA. Autor de Crecer (1989); Amor de noche y mar (1996); De las parras (1997); De mi desidia (1991); Con pecado concebido (2001); Azúcar, cayo y puerto (2002); Del milagro de la espera (2005); Temblor de espejos (2011); The Man Who Left/El hombre que se fue (2018) y Sugar, Cape & Port/Azúcar, cayo y puerto, 2018. 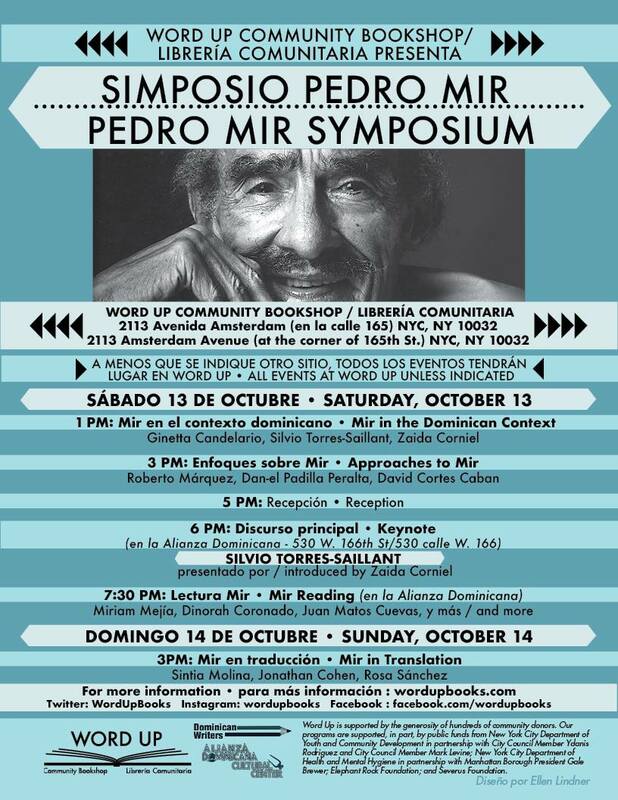 Miembro fundador de Palabra, Expresión Cultural (PEC), en NYC; Grupo Cultural Hostos en Worcester y de la Tertulia Pedro Mir, en Lawrence-MA. Sus trabajos han sido incluidos en numerosas antologías y revistas literarias. Matos es egresado de la Universidad Autónoma de Santo Domingo (UASD) con grado de Licenciatura en Química. Ha completado Maestría en Educación Elemental en Lehman College, Bronx, NY; Maestría en Educación Bilingüe en Worcester Staate University; MA. Además ha cursado estudios de literatura en la Universidad Complutense de Madrid y en la Universidad de Alcalá de Henares, España. Actualmente es maestro de Español Avanzado-Literatura y Cultura en North High School-Worcester; miembro de la Tertulia Julia de Burgos y de Casa Cultural Dominicana de Worcester. Sintia E. Molina es profesora de lengua y literatura caribeña y latinoamericana del departamento de Artes y Lenguas del St. Francis College en Brooklyn, Nueva York. Obtuvo su doctorado en literatura latinoamericana y caribeña del Graduate School and University Center de la Universidad de Nueva York (CUNY). Es autora de El naturalismo en la novela cubana, UP America (2001), co-editora de Dominican Migration: Transnational Perspectives, UP Florida (2005), y editora de la antología Escritoras dominicanas a la deriva: alienación, dolor y resistencia, Verbum, 2014. Sus artículos y ensayos sobre literatura y lengua aparecen publicados en antologías y revistas especializadas tales como Revista de Estudios Sociales, Callaloo, Latino Studies Journal. Es editora de reseñas de la revista electrónica Voces del Caribe e-Journal. Su investigación académica incluye arte y la literatura latina de los Estados Unidos, estudios de la mujer y el Caribe. Dan-el Padilla Peralta es Profesor Adjunto de Estudios Clásicos en la Universidad de Princeton, donde enseña y escribe sobre la historia cultural Romana y la recepción clásica; la historia global de la esclavitud y la ciudadanía; y la recepción de la antiguedad Greco-Romana en el Caribe Hispano colonial y postcolonial. Está afiliado a los Programas de Princeton de Estudios Latinos y de Estudios Latinoamericanos, y al Centro de Valores Humanos de la Universidad. Su libro sobre la formación del estado y la práctica religiosa en los siglos 4 y 3 BC está en contrato con Princeton University Press, y un libro en conjunto con otro autor sobre el año mágico 338 BC está en contrato con Harvard University Press. En conjunto con otro editor, ha editado un volumen sobre apropiación en la cultura Romana para Cambridge University Press (Rome, empire of plunder: the dynamics of cultural appropriation ) y ha publicado varios artículos sobre la historia cultural y literaria Romana. En el campo de la recepción clásica, está interesado principalmenet en qué medida Grecia y Roma antiguas están integradas en la política racial de la República Dominicana: dos ensayos futuros en los volúmenes editados de OUP sientan las bases para un libro llamado provisionalmente Racial classics in postcolonial Hispaniola, en el cual Pedro Mir figurará prominentemente. Además de escribir para publicaciones académicas, Dan-el está comprometido a la defensa pública. Contribuye y es miembro de Junta editorial de la revista Eidolon y ha publicado artículos cortos en The Guardian, Matter, Vox, y en The New York Times. En 2015, su memoria Undocumented: A Dominican Boy’s Odyssey from a Homeless Shelter to Ivy League (Penguin) recibió el Alex Award de la American Library Association. Rosa Mirna Sánchez es Profesora Adjunta de la Lengua, la Literatura y la Cultura Española, en el Departamento de Lenguas Modernas en la Universidad de Caldwell. Recibió su BA en Estudios Latinoamericanos de Barnard College, la Universidad de Columbia y sus títulos de Masters y Doctorado en Literatura Española de la Universidad de Virginia. Su investigación se concentra en literatura Hispánica del siglo 20, especialmente las nuevas escrituras de trabajos canónicos. Silvio Torres-Saillant es Profesor de Inglés y Profesor Decano de Humanidades en la Universidad de Syracuse, donde ha encabezado el Programa de Estudios Latino y Latinoamericanos, ha servido una cadencia de dos años como el William P. Tolley Distinguido Profesor Docente en Humanidades, y ha dirigido el Consejo de Humanidades. Su investigación se concentra en la historia intelectual, el diálogo Latino, literaturas étnicas Americanas, y poética comparada, y los regímenes raciales generados por la transacción colonial. Ha sido el autor de Caribbean Poetics (1997; 2nd ed. 2013), El tigueraje intelectual (2002; 2nd ed. 2011), Introduction to Dominican Blackness (1999; 2nd ed. 2010), An Intellectual History of the Caribbean (2006), Diasporic Disquisitions: Dominicanists, Transnationalism, and the Community (2000), y El retorno de las yolas: Ensayos sobre diáspora, democracia y dominicanidad (1999). En conjunto con la socióloga Ramona Hernandez, ha sido el autor de The Dominican-Americans (1998) y The Once and Future Muse: The Poetry and Poetics of Rhina P. Espaillat (2018) junto con la escolar literaria Nancy Kang. Ha co-editado The Challenges of Higher Education in the Hispanic Caribbean (2004), Desde la orilla: Hacia una nacionalidad sin desalojos (2004), y Recovering the U.S. Hispanic Literary Heritage, Vol. IV (2002). En el presente, está trabajando en “Racial Selfhoods: The Rise of Western Identity and the Fracture of the Human,” un estudio que procura relatar la historia de la manera en que nos convertimos en seres raciales. Un conferenciante frecuente aquí y en el extranjero, fue el orador inaugural en las Birmingham Modern Languages Lecture Series, Universidad de Birmingham, en el Reino Unido, en 2012, y dio la Conferencia Anual en Memoria de Walter Rodney, en la Universidad en Coventry, Reino Unido, en 2013. Sirvió en el panel de no ficción del Premio Bocas de OCM y dio una conferencia en el Festival Literario NGC BOCAS en Port of Spain , en Trinidad & Tobago, en 2015. Hizo un “discurso especial” (Círculo de Conferencias Especiales) durante la Feria Internacional del Libro XIX de la República Dominicana en Santo Domingo en 2016 y dio el discurso de apertura de la 58th Casa de las Américas Literary Prize, en Havana, Cuba, 2017. En 2018 dio el discurso de apertura en la conferencia “Global Dominican—Politics, Economics, and Cultural Production” realizada en la Casa del Senado, Universidad de Londres, Reino Unido, entre otros. Torres-Saillant ocupó su primer puesto en la Facultad en el Departamento de Inglés del Hostos Community College, de la City University of New York, y fue el director fundador del Instituto de Estudios Dominicanos de CUNY, en el City College of New York.